Present-day roads along this route: NM-478, NM-185, NM-187, NM-1, NM-408, NM-116, NM-314, NM-47, NM-313, NM-14, NM-466, NM-300, NM-50, NM-63, NM-445, U.S. 64, and many connecting segments of I-25 as well as the I-25 business loops. Route 1 was the El Camino Real, the main north-south road through the state. Much of it became U.S. 85 in 1927 - but, it is possible that segments between Socorro and Belen may have remained NM-1 for a couple of years because U.S. 85 may have been temporarily routed onto other routes that were in better condition. Also, because the renumbering coincided with construction of new routings, segments like those near Hatch were probably not marked as U.S. 85; rather, the new designation was put onto the new roadway. This is the first highway in the state to receive concrete pavement, between Las Cruces and the Texas border in the early 1920s. There was a lapse of over 40 years between disappearance of the original Rt. 1 designation and the redesignation of part of that route as NM-1. They are thus chronicled as separate routes. History: This part of old U.S. 85 was redesignated as NM-1 when I-25 was completed through this area in the mid-1960s. Improvements: This was paved when it became NM-1. Original paving probably occurred in the 1930s. Comments: The designation is apparently a reprise of original Route 1 , which became U.S. 85 in the late 1920s and then was eliminated. History: Original Route 2 south of Santa Fe. NM-2 was one of the original cross-state routes designated in the 1920s, running from Santa Fe south to the Texas border. After establishment of U.S. 485 (later 64), the NM-2 designation replaced the original route numbers north from Santa Fe to Española (originally Route 8), concurrent with U.S. 64, and north to Chama and then northeast into Colorado (orginally Route 36 ). NM-2 became U.S. 285 in the mid-1930s. The part NW of Española is now U.S. 84 as far as Chama, and NM-17 into Colorado. Comments: The designation was reprised on realigned portions of old U.S. 285 south of Roswell in the early 1950s (see next listing for details). History: In the early 1950s, U.S. 285 was relocated for about 10 miles from central Roswell to a point southeast of the city onto a new route, south on Main Street, west of its old alignment, . The old alignment was designated as NM-2. Later, in the mid 1960s, a new alignment of U.S. 285 was constructed from a point north Artesia to near the south end of the new alignment coming south from Roswell. The old alignment of U.S. 285 between those points was originally designated ALTERNATE U.S. 285. By the 1970s, the Alternate 285 designation was replaced with NM-2, leaving as a spur route also marked NM-2 the south end of the first U.S. 285 realignment. In the 1988 renumbering (or possibly before), the spur route became the north end of NM-2, and the segment into Roswell became NM-256. Improvements: Paved when it became NM-2. The original paving of U.S. 285 in this area occurred in the mid-1930s. Comments: This was a reprise of the old NM-2 designation for this part of the road. The southern terminus of NM-3 at U.S. 54 in Duran. Windshield shot, taken March 2008. 1927 designation: South of Vaughn, remained NM-3. North and east of Vaughn, became U.S. 54 and U.S. 66 . Designation was rerouted onto an entirely new routing N of Vaughn. (see below). History: Route 3 and NM-3 have had a continuous existence since before the mid-1910s, but no part of current NM-3 includes the route of original 1920s cross-state route 3. Originally, Route 3 began at Las Cruces, followed present-day U.S. 70 and 54 to Tucumcari, then U.S. 66 to the Texas border. Within a few years after establishment of the U.S. routes in 1927, the northerly end of NM-3 was realigned onto its modern routing north of Duran replacing NM-23 . In 1927, this rerouted NM-3 ran from Vaughn north to Anton Chico along a route that appears to no longer exist, but by 1930 or so it was moved west to its current alignment from Duran to Villanueva. Between Villanueva and Bernal, it followed what is now a partially non-existent route, but was moved west to its current alignment in the 1950s. South of Vaughn and later Duran to Las Cruces, the NM-3 designation was retained after 1927 even though U.S. 70 was extended concurrent with NM-3 through Alamogordo by 1932, and ultimately to Las Cruces by the mid-1930s. NM-3 was truncated at its present southern terminus by the early 1940s. In addition, in 1927 the route was extended southwest from Las Cruces over former Route 83. The road from Las Cruces to Columbus only existed until the early 1930s, but NM-3 had an apparently independent existence along what is now NM-9 from U.S. 80 near the Arizona border to Columbus until it was redesignated in the early 1940s. On the north end, NM-3 followed what is now NM-518 from Las Vegas to Taos, and NM-522 from Taos to the Colorado border. These latter segments were redesignated in the 1988 renumbering. Improvements: First paved part was the new connection from U.S. 85 near Ribera to Villanueva. Part from Duran to Encino paved mid-60s, Villanueva to I-40 paved first (early 70s), finally I-40 to Encino (may have been 1980). Also, there was no interchange with I-40 until the 1980s. Comments: Yes, this is a complicated, difficult to chronicle history, but even though the route no longer occupies any part of the original routings (and has not since the early 1940s), the felationship between NM-3 and original Rt. 3 is still evident from a study of historic maps. Present-day roads along this route: NM-80, NM-418, NM 377, NM-549, plus connecting segments of I-10 and I-10 business loops. May also include NM-372 and NM-28 in Mesilla area. The east end of Rt. 4 angled southeast from the later route of U.S. 80 to the hamlet of Aden, where it then went east-northeast toward Mesilla and Las Cruces. This route was bypassed about 1927. The west end was redesignated as an extension of Rt. 42 in the early 1920s. History: Original segments ran from San Ysidro to Valle Grande and Frijoles (now the Bandelier National Monument) to Pojoaque. The former route was originally NM-7 but was renumbered as NM-4 by 1932. By the late 1930s, completed across the mountain near what became Los Alamos during WW II. There was also a (business) Loop 4 that ran through Los Alamos. The segment from the Los Alamos business loop east was broken off in the 1988 renumbering and became NM-502 (to U.S. 84-285) and 503. Improvements: Between U.S. 84-285 and Los Alamos paved during the war. San Ysidro to Jemez Springs paved 1950s. Jemez Springs to Los Alamos Remainder by 1970. Comments: Not associated with an original cross-state route. Original Route 4 followed U.S. 80 across southern New Mexico. The business loop through Los Alamos was signed this way in the 1970s, and was probably so designated when the state took jurisdiction over this road (time uncertain, probably early 1970s). There is no evidence of any other designation given to this road. In the 1988 renumbering, this road became NM-501 entering Los Alamos from the west and NM-502 from central Los Alamos east to the junction with NM-4. The NM-502 designation was then extended over former NM-4 east to U.S. 84-285. History: Established by the early 1930s. Route changed slightly to intersect NM-30 more to the south. Apparently removed from state highway system in 1990s, now Indian Route 601. Comments: Originally followed a route close to Santa Clara Creek. Later marking of NM-6 on part of this route, after 1937, followed realignment of U.S. 66 off this route. They are thus chronicled as separate routes. History: Did not include any part of original route 6. But, after establishment of U.S. 66, this designation was immediately used for the "Laguna Cutoff" - the dirt road that served as the shortcut to Albuquerque, bypassing the U.S. 66 segment through Los Lunas. East of Albuquerque, it ran concurrent with U.S. 470 (which had replaced Rt. 10 through Tijeras Canyon), later U.S. 366, then replaced Rt. 46 to Moriarty and followed a route newly constructed in 1927 between Moriarty and Santa Rosa. In 1937, U.S. 66 was realigned along this route, bypassing the indirect routing through Santa Fe and Los Lunas, and the NM-6 designation was moved back to what had been original route 6, repacing old U.S. 66 between Mesita and Los Lunas. Improvements: The road was paved at the time it became the realignment of U.S. 66. History: Actually a part of original Route 6 until 1927, then became U.S. 66 until 1937. As noted in the listing above, the NM-6 designation was moved onto the Laguna cutoff in 1927. It was then moved back onto this route, its original route, when U.S. 66 was put on its ultimate alignment west of Albuquerque. Originally NM-6 ended at Los Lunas, but by the 1940s, NM-6 was extended south of Los Lunas on U.S. 85 to Belen, and then angled southeast toward U.S. 60 along what had previously been designated NM-52. The segment from Belen to NM-47 is now designated NM-309. NM-6 probably extended east to NM-47 in the 1930s, but the segment from U.S. 85 to NM-47 later became NM-49. This segment was redesignated NM-6 in 1988. 1927 designation: Appears to have been eliminated S of San Ysidro, but portion N of there remained NM-7 for a couple more years. Present-day roads along this route: NM-4. Between Cabezon and the Albuquerque area, there are roads that look like pipeline access roads (shown as gated) that may be remnants of the south end of this road. History : As noted above, the north part of original Rt. 7. Renumbered as NM-4 by about 1930. Likely, it was renumbered in anticipation of constructing this route to connect to NM-4. In 1932, the road was not complete but this route was designed as "4." History: Shown on map by late 1940s. Comments: Appears to be a state highway all the way to the park visitor center. 1927 designation: From Santa Fe to Taos, became U.S. 485 (later U.S. 64). N of Questa, became NM-3. Between Taos and Questa, it appears that Rt. 59 replaced this road as the main route. Present-day roads along this route: U.S. 84-285, NM-68, U.S. 64, parts of NM-150 and NM-230(? ), NM-522. History: First established mid-1930s. Ran through Eunice to the east, likely ran concurrent with NM-176 when that route was created and extended to Texas; then by the 1960s ran to the route 18 business loop (which became NM-207 in the 1988 renumbering). Terminated at NM-176 in 2006. Improvements: Paved by late 1940s. Comments: No connection to an early Route 8 (that ran from Santa Fe to Española). Present-day roads along this route: Most of this road is essentially nonexistent. This is an interesting route, running east of Rt. 1 from Socorro to Belen, and probably the better of the two roads. It appears U.S. 70 ran on this road until a westward extension across the Rio Grande was completed around 1930, and U.S. 85 appears to have occupied this road for a year or two until Rt. 1 was improved. By the mid-1950s, the road still appears on maps as an unimproved road, and it appears that dirt roads along its alignment south of U.S. 60 may remain today. Photo taken at east terminus of route, Luna - Doña Ana County line. History: Part of original route 83 , then by mid-1930s appeared as an independent segment of NM-3. When NM-3 was truncated by the 1940s, this was redesignated as NM-9. Extended east from Columbus to the Luna/Doña Ana County line probably after 2000. Improvements: Dirt and gravel for many years. First paved west of Columbus in 1960s, remainder by 1970s. Road east of Columbus that was recently added to the state highway system was paved while a county road in late 1990s-2000. Comments: The extension of NM-9 between the Luna-Doña Ana county line and NM-136 at Sunland Park is indistinguishable from the state road portion except for the speed limit (55 instead of 65), but is officially Doña Ana County road A-003. It appears to have been improved all at the same time, likely with state aid. The junction with NM-136 reads "To NM-9." History: Original Rt. 10, which ran from Albuquerque through Tijeras Canyon and then north. The Tijeras Canyon portion was replaced in 1927 by U.S. 470, and by the mid 1930s NM-10 was extended southward and by the 1940s was combined with existing route NM-15. Renumbered about 1970 to avoid duplication of route number (for I-10). Improvements: See NM-14, NM-337, and NM-55 for details. 1927 designation: Remained NM-11 except for short connecting piece to Mogollon, extended north to Arizona border over former Rt. 12 and south to Columbus over Rt. 29. South terminus: Mexican border (Mexico 24) S of Columbus at Palomas, Chih. History: No part of current NM-11 was original Rt. 11, but the two routes have common history. Current route established 1927 when Rt. 11 north of Deming was extended south over original route 29 south of Deming, When U.S. 260 was extended south in mid-1930s, NM-11 was truncated at Deming. Route essentially unchanged since then except for short turnback section in Deming. Comments: Route designation comes from original route 11 from Deming to W of Silver City. Though route ends south of I-10, it is fully marked from the interstate as if it were continuous. Spur: there was also a Rt. 12-A that went west to the Arizona line. This does not correspond with any present-day roads, though. History: Part of original route 12 (which ran south to near Mule Creek). Essentially unchanged in route since establishment. Improvements: Paved except Reserve to Apache Creek by mid-1950s; rest by late 1950s. 1927 designation: Became U.S. 566 from San Antonio to Hondo, U.S. 366 from there to Roswell, remained NM-13 east to the Texas line. West end routed south as described below. History: Current segment was established 1927 when original Rt. 13 west of Roswell was renumbered and was reestablished to the south. Originally ran north along what is now called "Old YO Crossing Road" to Roswell. Rerouted east to U.S. 285 by about 1970. Improvements: Paved by the time it was routed along current alignment. History: Originally Rt. 105, became NM-14 in 1927. This was the more direct but originally less improved alternate route to U.S. 80 west to Benson, AZ. Designation removed after completion of I-10 around 1960. Comments: Although NM-14 and AZ-86 were a more direct route from Texas to Arizona, U.S. 80 looped south to the Mexican border at Douglas, AZ. I'm guessing these roads carried the bulk of through traffic by 1950, and they became the alignment for I-10. It is indeed a scenic byway. Taken May 2005 near Madrid. History: See NM-10 for pre-1970 history. NM-10 renumbered to avoid duplication of I-10 around 1970. Route extended into Santa Fe along old U.S. 85 when that route was eliminated around 1988. In 1988, due to the fact that this route had a brief overlay with NM-333 (former U.S. 66), it was broken up south of I-40 into NM-337 and NM-55. Comments: Designated as the Turquoise Trail. Popular as a pretty backroads drive from Santa Fe to Albuquerque. Area from Tijeras through Cedar Crest is becoming a significant bedroom community for Albuquerque. History: Established in the mid-1930s. The south end of this route initially intersected U.S. 54 a few miles north of Carrizozo, and a new road was constructed between Claunch and U.S. 54, terminating a few miles north (at the now-defunct village of Hurburt). The 1940 official map shows this new road with the designation NM-195 though old 15 has been removed from the map; however, a Gousha map from the same year shows the new road as NM-15. Within a few years, NM-15 was combined with NM-10, and the short piece between NM-10 and NM-41 became NM-55. Comment: It's interesting that this incarnation of NM-15 has the same endpoints as today's NM-55. Most of this route was combined with NM-10 (later 14) but the 1988 renumbering resulted in the south end being rejoined to NM-55 (the last remnant of original 15). Not clear why, when the route was cut back in the early 1940s, the remaining piece (55) got a new number. North terminus: Gila Cliff Dwellings Nat'l Mon. History: Originally part of Route 187 (established late 1930s, which included today's route 35, and renumbered 25 in 1940s. Segment from NM-35 to Gila Cliff Dwellings originally designated NM-527 around 1960. Renumbered in 1970 to avoid duplication with I-25 and combined with 527 to form current route. Comments: From Pinos Altos north to the junction with NM-35, this is a very narrow and winding road. For about 20 miles, there is no center stripe. Don't expect to get from Silver City to the Gila Cliff Dwellings in under 1-1/2 hours. Marked what is now the segment of U.S. 70 that crosses Apache Summit and goes by Ruidoso. History : Established about 1930 when NM-18 was rerouted south from Hobbs instead of west. By about 1944, U.S. 180 had been established along this route and U.S. 62 was re-routed along new U.S. 180 into Texas. Taken May 2005 near west terminus of route. History: Part of NM-22 as established around 1960. Renumbered NM-16 when 22 was broken up in the 1988 renumbering. Improvements: Paved by time of establishment. Comments: I seem to remember a dispute in the 1970s between the Cochiti Pueblo and the state over a road passing through their Reservation. The tribe blocked the road for a while to enforce what they believed to be their jurisdiction over it. This may have been it, back when it was part of 22. This is one of the few original state routes that were eliminated prior to the 1927 route renumbering. This was eliminated as a separate route when Rt. 14 was extended north to Portales. History: Apparently established when U.S. system introduced, replaced original route 35 from Farmington to Chama. Also ran north from Chama on current NM-29 for a short time (part of this road probably does not now exist). When U.S. 285 was re-routed along current route through Tres Piedras, the road over the pass was redesignated NM-19. By late 1950s, 19 renumbered 17. On the west end, when U.S. 64 was extended west around 1975, it replaced 17 west of Chama. The old segment from Farmington north to Colorado was then renumbered NM-170. Angled northeast from Roswell to Clovis, then north and west to Tucumcari. The segment southeast of Tucumcari may include parts of NM-278. It angled northeast to the Texas border - possibly with a marked spur to the state line - and also ran north at Nara Visa to Clayton. The terminus at the Oklahoma state line appears to be south of current NM-456, and no road on the map corresponds to this location. History: At its longest, this route was part of original route 18 (Tucumcari-Clayton). In the late 1920s, it extended south to west of Hobbs and then went west through Carlsbad and southwest into Texas along former Route 15 . By 1932, it went south from Hobbs into Texas and its former southwest end became NM-16 (now U.S. 62-180). Until 1988, it extended virtually the height of New Mexico from Texas almost to the NE corner. Truncated to its current length in 1988. Remainder of this route renumbered NM-206 (Lovington-Portales); NM-209 (Clovis-Tucumcari); NM-402 (Nara Visa-Clayton); and NM-406 (Clayton-NM-456). Ran southeast from Belen then east through Mountainair, Vaughn, Fort Sumner and Clovis. History: Established c. 1927 along the road that had originally been Route 32 . This route became U.S. 550 when that route extended into New Mexico c. 1935. Comment: The number was probably changed from 32 in 1927 because, 1) a more southerly segment of Route 32, separated from this by U.S. 666, became NM-32, and to match the designation in Colorado. History: Current route of NM-17 (see above). Originally part of NM-2, then U.S. 285. Renamed NM-19 c. 1940 when U.S. 285 rerouted via Tres Piedras. Renamed CO-17 late 1950s. History: Route established as NM-40 in early 1950s. Renumbered NM-19 to prevent conflict with I-40 around 1970. 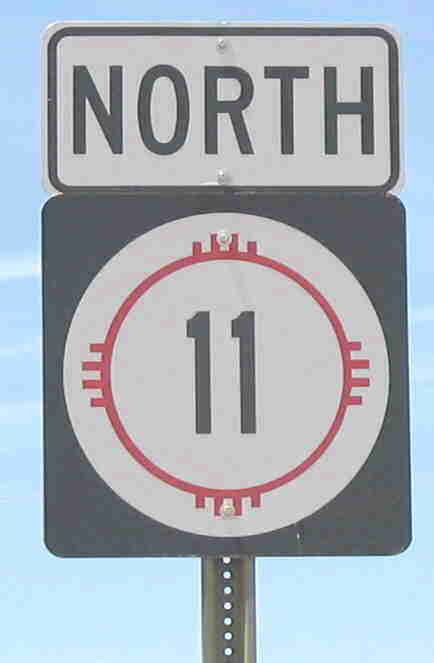 Comments: Counting the original pre-1927 Route 19 (U.S. 60 east of Socorro), there have been four separate routes with the designation "19" in New Mexico. Photo taken at the junction with U.S. 60 just west of Ft. Sumner. Present-day roads along this route: Possibly NM-272 S of Fort Sumner, U.S. 84, old NM-67. Previously --- U.S. 66 east of Santa Rosa (1930-35); NM-65 E of Las Vegas (possibly a separate segment not connected to the rest of 20). History: Original 1920s Route 20 ran from east of Las Vegas south to Santa Rosa, then to Fort Sumner and then east of the current route of this road south to U.S. 70. (Probably current NM-272 and county roads.) By c. 1930, it was on this route with the northern terminus at Santa Rosa (the 1932 map does not show the segment near Las Vegas, but later mid-1930s maps do). When U.S. 84 was extended into the state in the mid-1930s, it took the northern part of this route. The segment near Las Vegas was renumbered NM-67 by the 1940s. Improvements: Northern half paved late 1940s, rest late 1950s. Comments: This is a good connecting route from U.S. 60 at Fort Sumner to U.S. 285 north of Roswell, but it is a very lonely route. You won't encounter many vehicles along this route. Also, it is posted 55 mph, and after a short distance you realize why. The condition of the roadbed is such that the road is very uneven. Included two presently nonexistent roads: Mora to Ocate via Lucero, and Ocate to Rayado (a later deletion as described below). History: Part of original Route 21 near Cimarron. Extended over roads that apparently no longer exist south to Ocate. State road cut back to county line. Later combined with NM-199 east to Springer, possibly as part of 1988 renumbering. Improvements: NM-199 part from Springer west to Miami paved by mid-1950s. Rest probably paved by 1980 or so. Early maps do show a purported connection from Santa Fe directly to Las Vegas via Cowles (the end of NM-63) and El Porvenir. Modern maps show a trail from the Santa Fe ski area east, and another tantalizing idea is that this road extended from the end of Canyon Road up the Santa Fe River. But whether a passable road over the mountains from either location ever existed is questionable. None of this route appears to have existed concurrent with post-1927 NM-22, though the designation may have been carried over because of the proximity of NM-22 to Santa Fe. They are therefore shown as separate routes. Taken May 2005 near junction I-25. b) U.S. 85/I-25 from current junction with 22 south to NM 10 (now 14) (1950-88) Renumbered as NM-301, now Sandoval County 52A, Santa Fe County ? e) U.S. 84-85-285 at Santa Fe Plaza to U.S. 84-285 at Tesuque (1930-88). Became NM-590, now a county road. History: First established along Bishops Lodge Road from Tesuque to the Santa Fe Plaza in c. 1930 (segment e). Next extensions were around 1950, segments b, c, d, and f (though the extension past the Santa Fe Airport was not complete until the mid-1950s). These were the extension northeast of Tesuque to the village of En Medio, and along Agua Fria St., past the Santa Fe Airport south of Santa Fe, across U.S. 85, down to NM-10, along 10 and back to U.S. 85. The current segment to Cochiti Lake and a leg back to U.S. 85 were designated around 1960. I can't tell whether this was a branched route, with a spur extending to Cochiti Lake, or whether that portion of the road was under jurisdiction of the Cochiti Pueblo. This mess was thankfully broken up in 1988. New designations indicated above. Improvements: Cochiti Lake segment paved by late 1950s. Comments: This route probably was the cause celebre for the 1988 renumbering, with its circuitous routing and overlays with other routes. When I was living in Albuquerque in the mid-1970s, a tourist from California wrote the Albuquerque Journal to complain that "every highway in the state seems to be marked '22'." History: By about 1930, NM-3 had been moved onto this route. History: Established mid-1930s. Removed from highway system by mid-1980s. Now Indian Route 23. 1927 designation: NM-24 east to Piñon only. East up La Luz Canyon to Cloudcroft, then southeast through the Sacramento Mountains to Piñon. From there, the route extended southeast and then east over what are now either Forest Service roads or nonexistent roads to Carlsbad. History: Part of original 1920s route 24. Mescalero-Cloudcroft segment added mid-1930s. Combined with NM-33 from Pinon to U.S. 82 on east by the 1940s. In 1988, broken up into NM-244 and NM-130. Improvements: Paved as far south as the National Forest boundary by the 1960s. Route eliminated by early 1920s. This road was removed from the state highway system by the early 1920s. There are county roads that cover much of the general route of this road, but whether they are related is not known. It is probably coincidental that the NM-25 designation was reused for a road north out of Silver City in the 1940s as described below. No connection to post-1927 NM-25. History: Originally part of NM-187 (established late 1930s, which included today's route 35, and renumbered 25 in 1940s. It isn't clear why 187 became 25. Renumbered around 1970 to avoid duplication with I-25.